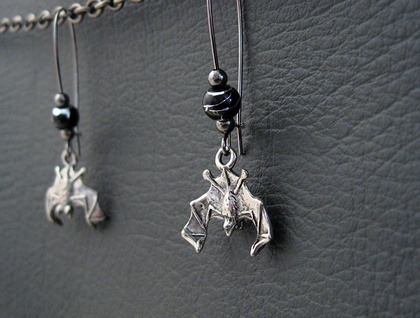 Antiqued-silver coloured bats dangle – upside down, of course! – from arched, gunmetal black ear-wires. 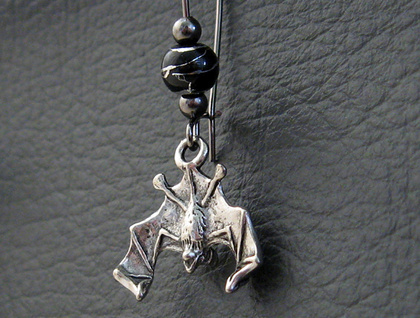 Above each little bat, adorning the ear wire, is a black glass bead streaked with bright silver, like flashes of starlight. Each bead is framed top and bottom by a smooth, tiny, gunmetal-black bead. 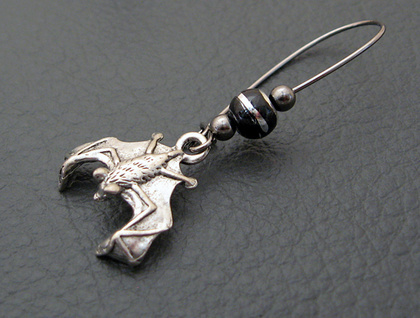 These little winged creatures of the night are made of pewter. They are clinging to their roosts, wings spread, about to take flight. Their mouths are open, ready to snap up any insects they pass. They have wonderful, lifelike detailing on both sides, and are hung so that one bat faces toward the wearer, showing its furry back, and one bat faces away. They move slightly when the earrings are worn, as though they are on the point of fluttering away into the night. 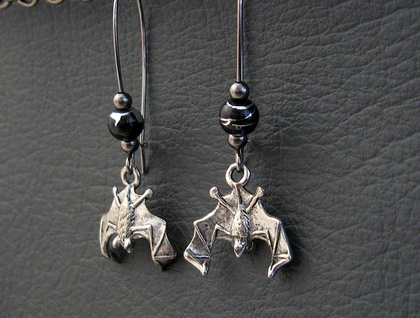 The 'Bats At Midnight' earrings measure 50mm from top to bottom. The little bats are 19mm across, from wingtip to wingtip.